“Each tour group consists of 10 people because only 10 fit in this elevator,” said our tour guide at Winterthur, a house museum featuring American decorative and fine arts in Wilmington, Delaware. It’s six flights from the tour staging area to the first of the tour rooms and we’re squeezed in – shoulder to shoulder — a small elevator for the trip. “At least they didn’t ask to weigh us,” says my friend Patricia. Eleuthère Irénée du Pont was a French chemist who emigrated to the US in 1800. He settled in the Brandywine Valley in Delaware, founded a gunpowder manufacturing company, and purchased the land that would become Winterthur. After his death, his daughter Evelina bought out the rest of her siblings and settled on the property, calling it Winterthur after the Swiss city from which her husband came. They built a 12-room house on the estate in 1837. By 1927, the house had expanded to 30 rooms and belonged to their grand-nephew, Henry Francis Du Pont. Henry had an interest in American decorative art, developed after a 1923 visit with Electra Havemeyer Webb (whose own American art collection would become the foundation for the Shelburne Museum) in Vermont. Almost as soon as he inherited Winterthur from his father, Henry began the process of turning it into a museum. He bought not only objects — they have over 90,000 objects made or used between 1630 and 1860 — but entire houses, which he then took apart so that he could incorporate their architectural fragments into the house at Winterthur. By the time he’s done, the house had 175 rooms. The tour consisted of (parts of) two floors of the house (the Winterthur website contains a floor plan of all 8 floors, in case you’re wondering how the house is arranged). We started with some bedrooms on the sixth floor, each interior taken from an older house. 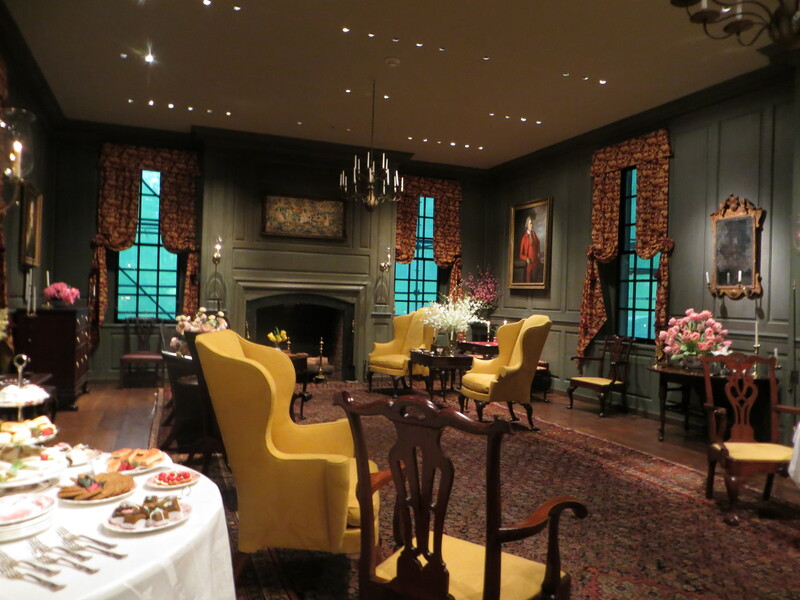 All of the du Pont’s guests got breakfast in their rooms at Winterthur. They got a card the night before, on which they could write their preferences. I don’t know if they were told their options or if they just wrote down anything (broiled emu) and Cook did her best to accommodate. From the bedrooms, we headed to the gathering and entertainment spaces on the fifth floor. As we went down the stairs, we heard a piano. 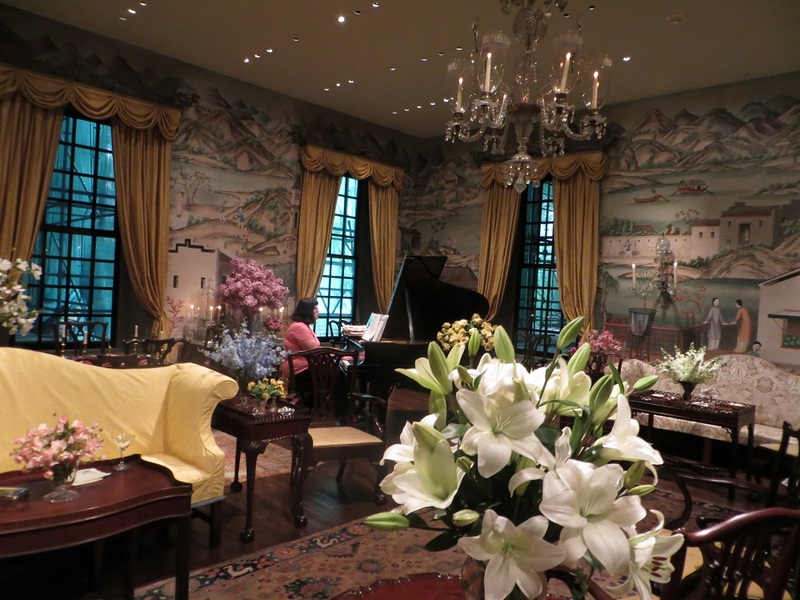 Someone was playing Mrs. du Pont’s 1907 Steinway in the Chinese parlor. The Chinese parlor – Mrs. DuPont’s entertaining space – is so called because it’s covered in wallpaper made in China in 1780, depicting scenes of Chinese life. Down the hall from the Chinese parlor is the equally impressive Marlboro Room, with wood paneling from the 1745 Patuxant Manor in Lower Marlboro, Maryland. “The staff agreed that if we were having a Superbowl party,” joked the guide, “this is where we’d have it. We’d just replace that painting above the fireplace with a large television.” Sadly, no parties allowed in the house, so no chance of nachos and beer pong in the Marlboro Room. I have to mention that Henry was a George Washington fan and almost every room has a piece or two with a GW theme. Other H.F. du Pont trivia: He helped Jacqueline Kennedy with her renovation of the White House in 1961-63. One of the most intriguing pieces of art was in the main dining room – a painting by Benjamin West, of the signing of the Treaty of Paris (formally ending the American Revolution) in 1783. 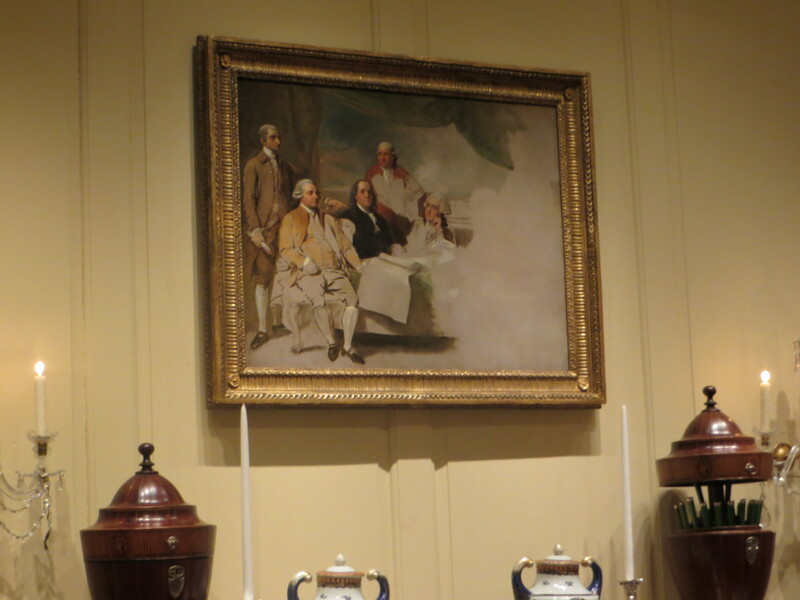 The Americans are in the portrait, but it’s empty where the British should be. West thought that the British were amenable to sitting for the portrait. He thought wrong. The house opened fully and permanently as a museum in 1951 and the family moved to a cottage nearby. The cottage is now the museum store. We took the basic tour included in general admission, but there are other specialty tours that can be had for a price (details on their website). I’ll have to go back, because I’d love to see what’s on those other floors. 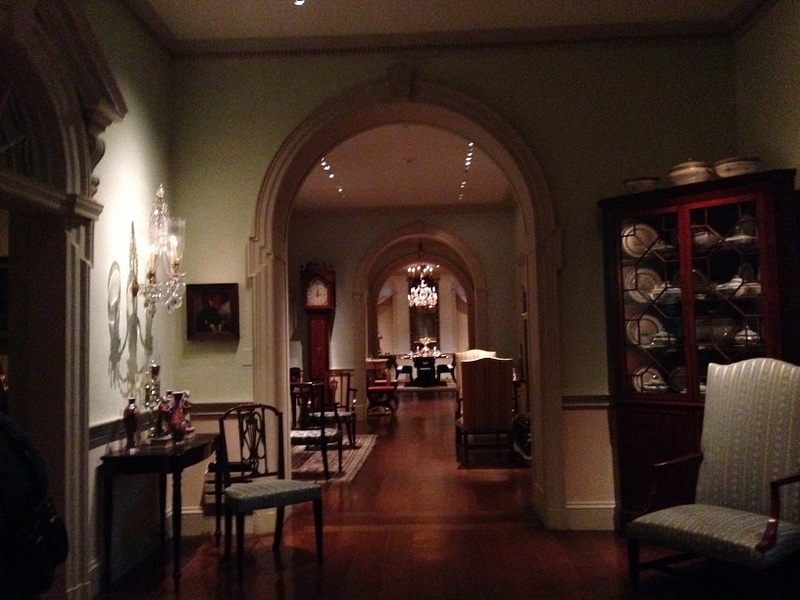 Gallery | This entry was posted in Delaware and tagged American decorative art, Henry Frances du Pont, historic house, Winterthur Museum. Bookmark the permalink. I like the unfinished Benjamin West painting, such a great detail. I thought it was fascinating. So much more compelling than a finished product would have been. Great article. 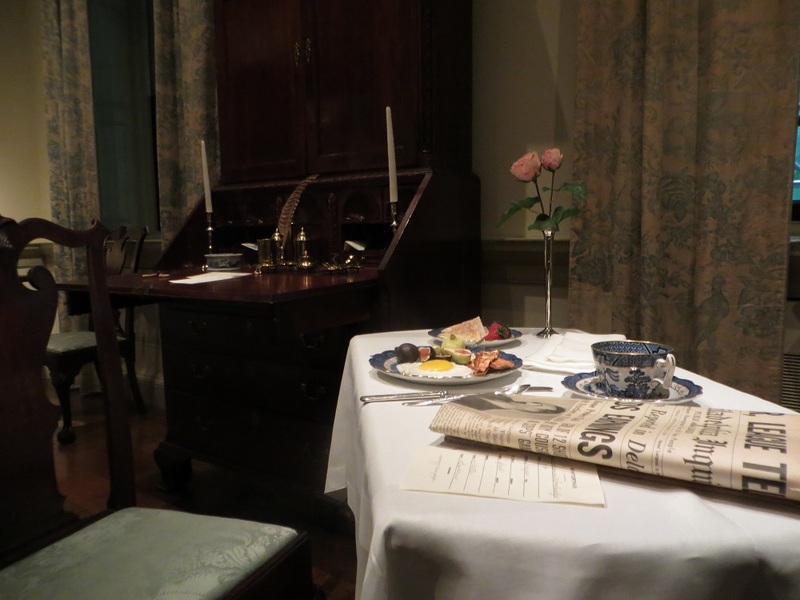 My wife and I visited in July, 2014 and saw the Downton Abbey exhibit which was spectacular also. Highly recommend a visit there for Downton fans prior to Jan 2015. Thanks for stopping by. I definitely plan to go back to see the Downton exhibit a second time before it goes away in January.